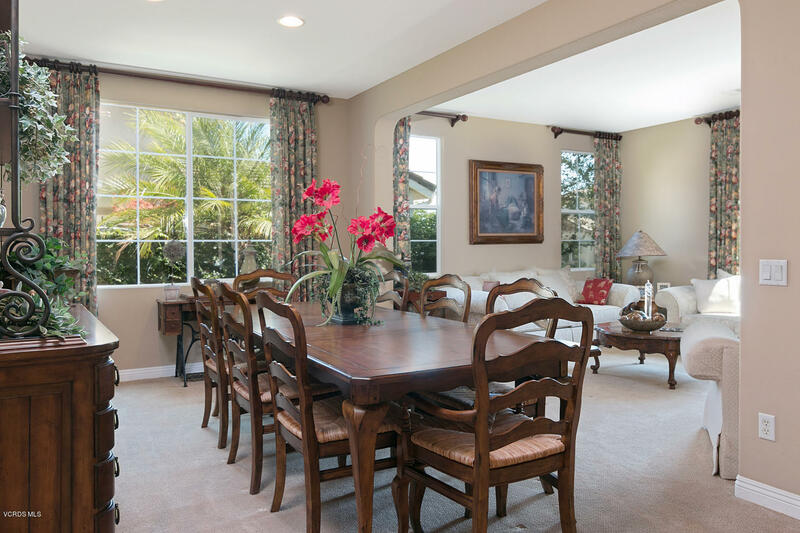 Welcome home to this fabulous Toscana 4 bedroom 3 1/2 bath home in the Serenada area of Moorpark! Amazing floorplan with the master bedroom suite located downstairs, and an additional bedroom with an ensuite bathroom downstairs. Upstairs you'll find a loft with built-in desks, two bedrooms and a Jack-N-Jill bathroom. The loft area is a space for doing homework! There is tile flooring throughout much of the downstairs. Entertainer's kitchen with large granite island, and tumbled tile stone countertops. Stainless steel appliances were added a few months ago including a 5 burner gas cooktop/hood, built-in microwave, and large double ovens. Lovely dark maple cabinetry with oil-rubbed bronze knobs. Butler's pantry leads into formal dining room, which is quite large. Formal living room is quite lovely. There are plantation shutters throughout much of the home. Family room has custom built-in for TV, surround sound, and a cozy fireplace. Master suite features frameless shower glass doors anda soaking tub. Master closets have custom built-ins, and the laundry room is located near the master bedroom, making it very convenient. Lovely outdoor seating areas with lush foliage in the backyard, plus a dog run on side. 3-car tandem garage w/ overhead storage racks.